One of my favourite foods is pumpkins and my favourite chef is Emeril Lagasse, so this recipe which combines both is pretty memorable. Arrange 8 (1/2-cup) ramekins or custard cups in a large metal baking pan. In a medium saucepan, combine the cream, brown sugar, and 1/4 cup granulated sugar. Bring to a bare simmer over medium-high heat, stirring to dissolve the sugar. Remove from the heat. In a medium bowl, whisk the egg yolks until frothy and lemon-colored. Slowly add 3/4 cup of the hot cream mixture, whisking constantly. Add the egg mixture to the remaining hot cream, and whisk. Add the vanilla, cinnamon, nutmeg, and pumpkin, and whisk until smooth. Strain through a fine mesh strainer into a large bowl. Divide among the prepared custard cups. Add enough hot water to come halfway up the sides of the cups. Bake until the custards are just set in the center but not stiff, 45 minutes to 55 minutes. Remove from the oven and refrigerate until well chilled, at least 3 hours or overnight. Sprinkle each custard with 1/2 teaspoon of the remaining sugar. 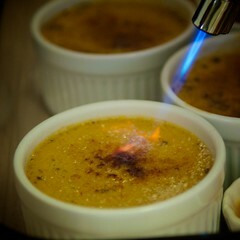 Using a kitchen torch, caramelize the sugar. (Alternately, preheat the broiler, and broil until the sugar melts and caramelizes, watching closely to avoid burning and rotating the cups, about 1 to 2 minutes.) Place on small dessert plates and serve.